I've spent considerable time as an agency owner putting myself in the shoes of our clients and prospects to better understand when an agency like ours, or any agency — creative, brand, web, inbound marketing, etc.— is the right investment and when it isn't; here are my insights. A holistic view of your business is necessary to achieve your marketing goals. If your business has some complexity, such as multiple products and/or solutions, multiple audiences or varying vertical or horizontal competitors, it's likely you will need an agency partner that "gets it." When prospects consider a creative agency like ours, they often make judgments based on a portfolio, assessing how many clients we've done work for in their sector. The reality is that in order to build a brand, create a website or launch a marketing program, we become rapid experts in your business, not just your sector, and engage in a confidence-building rapport with your C-level executives in order to translate their goals into measurable results. It is understood that creatively conveying your business story can be the difference between success and failure. When Mark Twain said, “I didn't have time to write a short letter, so I wrote a long one,” he did not anticipate the analog to most websites and corporate communications. But the ability to distill the essence of a brand and communicate its value with a creativity equal to its conciseness, requires a professional team with experience and insight. Too many cooks in your kitchen could become a recipe for disaster. An agency with a strong process and the right personality — to engage a broad array of corporate decision makers, foster consensus and juggle complex or multiple projects — is critical to building confidence, not to mention delivering results on time and on budget. The use of technology is an important decision point. Creating brands, websites and marketing programs requires the use and integration of a variety of technologies such as: web content management platforms, marketing automation systems, CRM systems and analytics packages. Marketing has become such a technical, data-driven expertise that CMO's are spending a majority of their time reeducating themselves to stay abreast of developments. A good agency will be both student and master of the technology required to be a successful marketer. This expertise will add continual value. Objectivity and experience are esteemed. Leading, managing and updating the RainCastle brand, website and marketing over the years has been and continues to be a challenge. While we do this successfully for our clients, it is our objectivity and consultative approach that makes us a valuable partner; this can be more elusive when we consider our own brand. And for those that don't do this for a living, it is even harder to see the big picture. The right agency partner is a great listener and brings that necessary, objective and experiential component to the mix. Price is the top decision-driver. Let's face it, price is always a driver. But it is not always the top driver. In the B2B space,"Brand" is a loaded word. Among some, it conjures the vision of expensive right-brain consultants asking questions like, "If you were an animal, what kind of animal would you be?" B2B companies that generally attain business through referrals and word-of-mouth and often deal with technical products, tend not to believe in brand as a worthy investment. They often view the website as a commodity; after all, they've seen templated website solutions advertised for a fraction of the price an agency would charge. And marketing is sometimes viewed as the soft underbelly of sales. If these perspectives resonate, then you probably don't need an agency. Good enough is... good enough. If you're tech-savvy and know that there are website tools like Squarespace, creative resources like crowd sourced design and Google AdWords for search, you can create a reasonable market presence for a relatively small investment. It may look and feel a bit cookie cutter but if having a presence is really the point, more than developing a truly differentiating identity or building a sustained lead generation engine, ix-nay the agency. Your needs are tactical, not strategic. Execution is always important but many freelancers can execute what they are told with efficiency and cost-effectiveness. If you don't need strategic thinking, nuanced copywriting, lead generation, dedicated account management or consulting, chances are there is an individual or small shop that can execute what they are given and be a great resource. Projects are too small and have no follow-on. If you have a small, self-funded start up and you visit an agency website that offers a full range of services and displays only work for corporations, chances are that agency is overkill. By quickly perusing the work displayed and a mission statement or reasonable facsimile, usually found under "About Us," you can determine that an agency may not be necessary. There is a strong in-house marketing or design team. We've worked with many companies that have in-house teams. This can work well when the division of labor makes sense for both parties. It becomes more challenging to work with an agency when the things the in-house team does are the agency's area of expertise. For example, hiring a web agency to build a website that the in-house team designs, creates an imbalance of resources that an agency is used to employing in equal measure. When the agency is hired to set the strategic and creative direction, there is often a successful way to divide and conquer the executional tasks based on that upfront work. 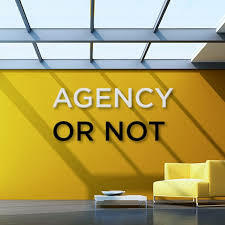 Do you have further thoughts about the value agencies bring and when other resources are better-suited to a task?